American Express has recently revamped their Premier Rewards Gold card, improving benefits and features quite a bit, as well as increasing the annual fee. If you spend a fair amount of money eating at restaurants or grocery shopping, this may be the best new card for you. The new AMEX Gold card earns 4x Membership Rewards points at US restaurants and US supermarkets (up to $25,000 per year). 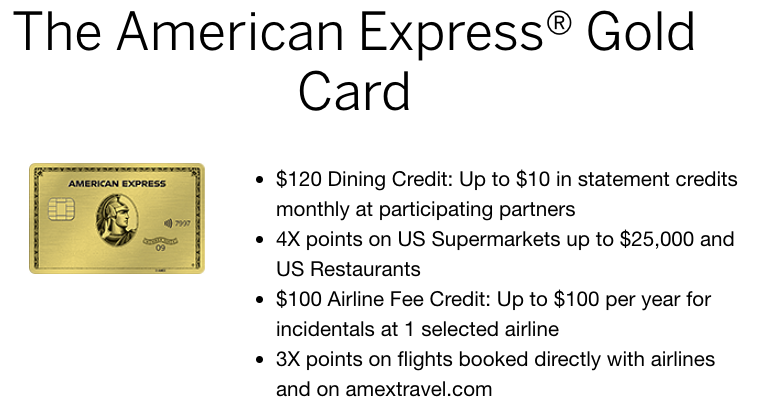 The Gold card earns 3x Membership Rewards points on flights booked directly with airlines or on amextravel.com. There is a $120 dining credit, which allows you to earn up to $10 in credits every month when you pay with your Gold card at participating partners (Grubhub, Seamless, Cheesecake Factory, Ruth’s Chris Steak House and Shake Shack). The Gold card keeps the $100 Airline Fee Credit, which still seems to work for airline gift cards (Southwest is what we usually purchase). This card also does not charge any foreign transaction fees. 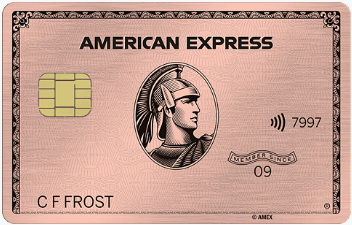 For a limited time, the new American Express gold card comes in a limited edition Rose Gold metal card until 1/9/2019. If you are approved before 1/9/2019, you are also eligible to receive 20% statement credit, up to $100 per Card account on purchases made at US restaurants during the first 3 months. The current sign up offer for the American Express Gold Card is 50,000 points after spending $2,000 within the first 3 months. This card does have a $250 annual fee, NOT waived the first year. With the 50,000 point sign up bonus, $120 dining credit, $100 dining bonus, and $100 Airline fee credit, it’s easy to get significant value out of the card the first year. Since I previously owned the Premier Rewards Gold card, I was not eligible for this sign up bonus. My wife was eligible and she was excited to apply for (and get approved for) her Rose Gold card! This is now our new go to card when it comes to restaurant purchases (replacing the Chase Sapphire Reserve card). You can sign up for your Gold or Rose Gold card here (my wife will earn referral credit if you sign up for through this link).